Mechanical systems are becoming increasingly sophisticated and continually require greater precision, improved reliability, and extended life. To meet the demand for advanced mechanisms and systems, present and future engineers must understand not only the fundamental mechanical components, but also the principles of vibrations, stability, and balance and the use of Newton's laws, Lagrange's equations, and Kane's methods. Dynamics of Mechanical Systems provides a vehicle for mastering all of this. Focusing on the fundamental procedures behind dynamic analyses, the authors take a vector-oriented approach and lead readers methodically from simple concepts and systems through the analysis of complex robotic and bio-systems. A careful presentation that balances theory, methods, and applications gives readers a working knowledge of configuration graphs, Euler parameters, partial velocities and partial angular velocities, generalized speeds and forces, lower body arrays, and Kane's equations. 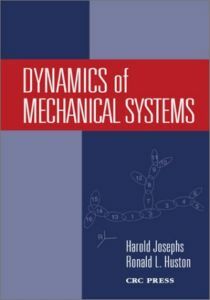 Evolving from more than three decades of teaching upper-level engineering courses, Dynamics of Mechanical Systems enables readers to obtain and refine skills ranging from the ability to perform insightful hand analyses to developing algorithms for numerical/computer analyses. Ultimately, it prepares them to solve real-world problems and make future advances in mechanisms, manipulators, and robotics.